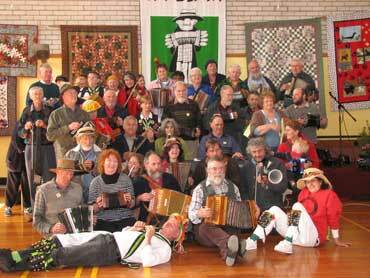 for players and lovers of concertina, button accordion, melodeon, mouth organ, jaw harp, musical saw and gum leaf . . .
Artists: Gay Charmers, Peter Ellis, Rob Willis, Dave de Hugard, Paddy Fitzgerald, Joan & Ray Munday, Mark & Lisa McDonnell, Jamie Molloy, Peter Hyde, Veranda Coots, Fred PRibac, Mike Manhire, Chris von der Borch and more. Plus: Old Time Dance, concerts, sessions, National Button Box Championship, National Windjammer Championship. It's a button box bash . . . Weekend Earlybird (until 10th Oct): $35 ($25 conc) or at festival: $45 ($35). Day and evening tickets available. By donation 18 years or younger and 80 years or older! Bookings/Enquiries: Sarah (03) 6239 1899 or (0409) 218 414.